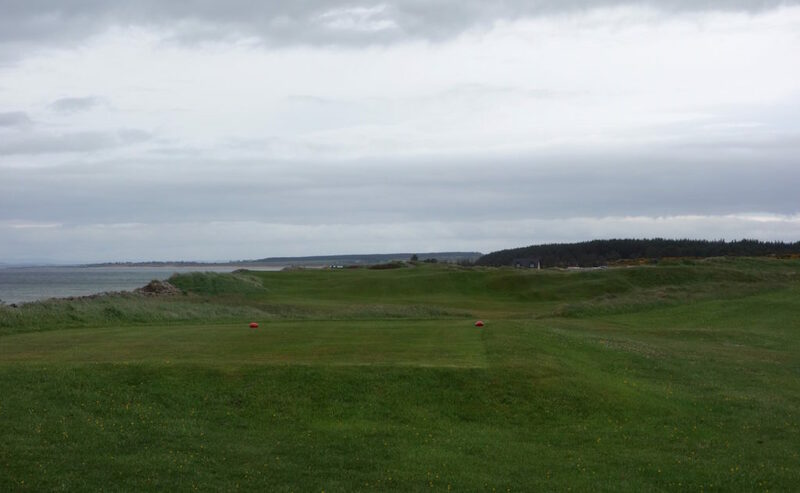 During years of friendship with Ru Macdonald from the Scottish Golf Podcast he’s always told me to visit Golspie Golf Club. 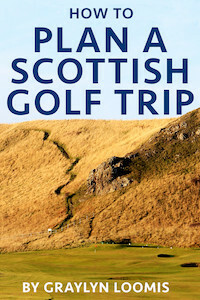 He insisted it was a local gem that embodied the best of Scottish golf and partly due to his urging and partly due to my love of the Scottish Highlands, I jumped at the chance to go this summer. 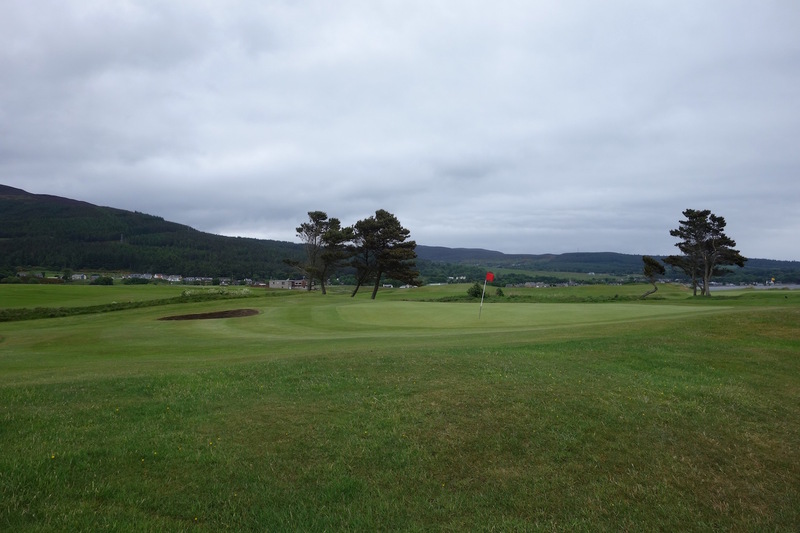 My visit to Golspie came while driving the North Coast 500 – a driving route / road trip through the rural north of Scotland. Look out for more about the route in a future post! 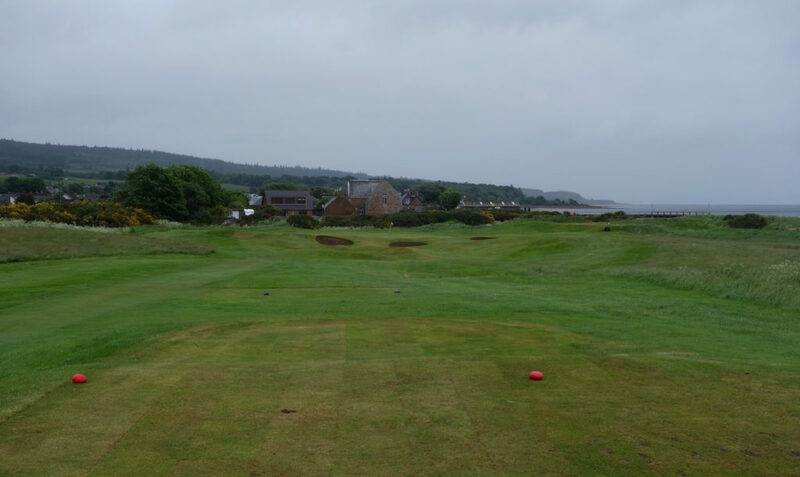 Golspie is found on the drive about 30 minutes north of Royal Dornoch, and is typically the most northerly point golf tours will venture. 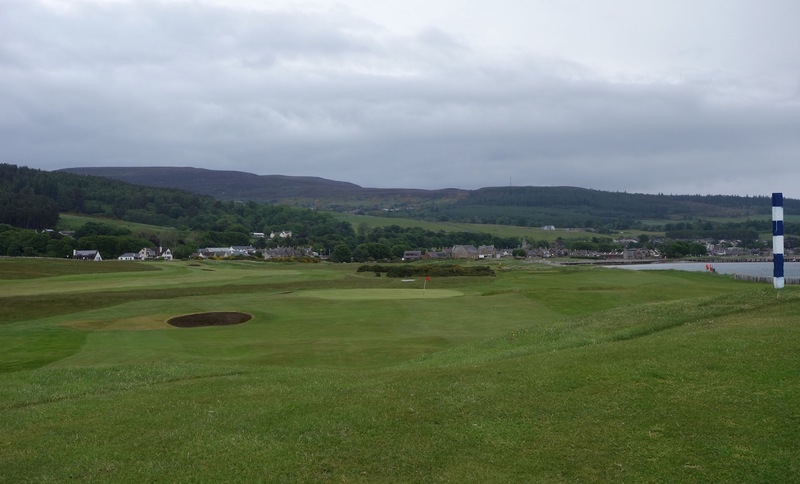 Golspie embodies many of my favorite aspects of Scottish golf. When I arrived the clubhouse hadn’t opened yet, but the door was unlocked. Inside the door was the locker room and a small table with a sign explaining that guests were welcome to play if they slipped their green fee through the slot next to the pro shop door. It is the opposite of a commercial tourist destination. Instead, it’s run by a group of dedicated locals as exhibited most recently when the club had to crowd-fund a new mower. One of their two machines, both maintained by a volunteer mechanic, failed and the club didn’t have the funds to purchase a new mower outright. 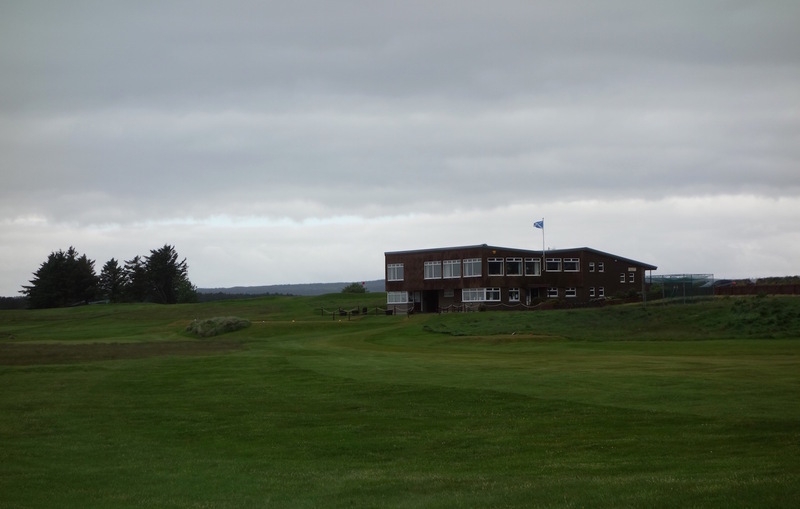 After weeks of fundraising, Golspie secured the money from friends and staff at the club. While at the club I had the chance to speak to the superintendent who does a tremendous job maintaining the course. His team maximizes their small budget and keeps Golspie in top shape throughout the year. 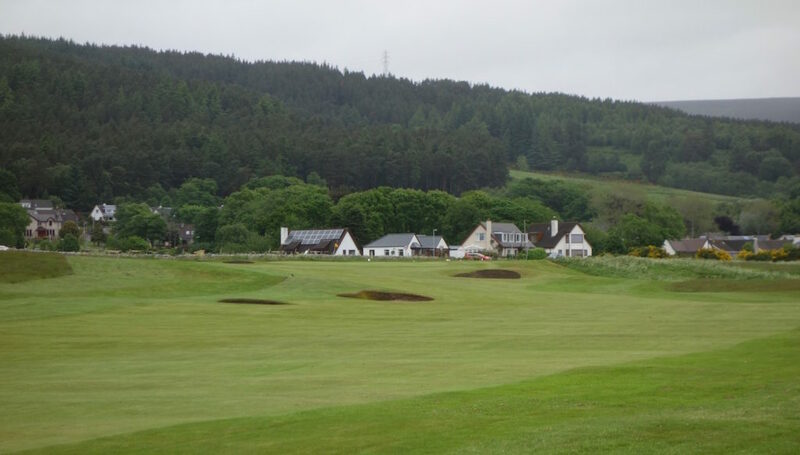 More visitors would benefit the club greatly, and if you’re in the Highlands playing golf, it should definitely be on your itinerary. 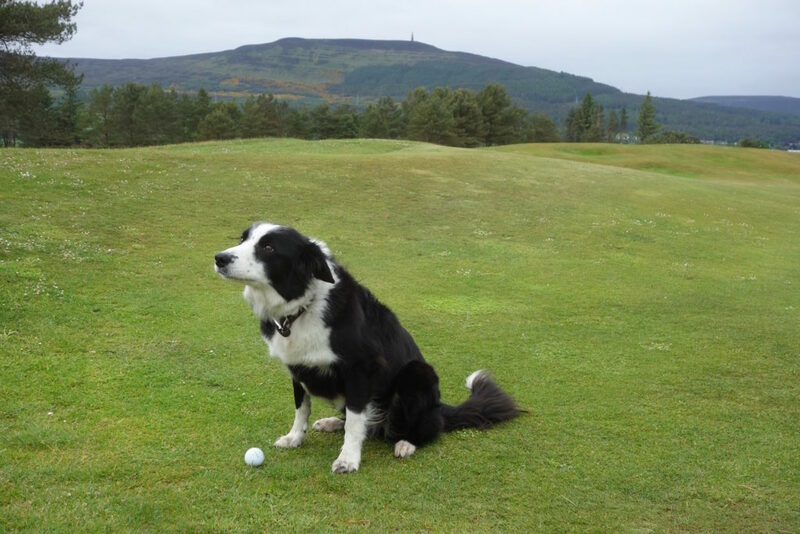 Also keep an eye out for the superintendent’s dog, who is a Golspie mascot of sorts. 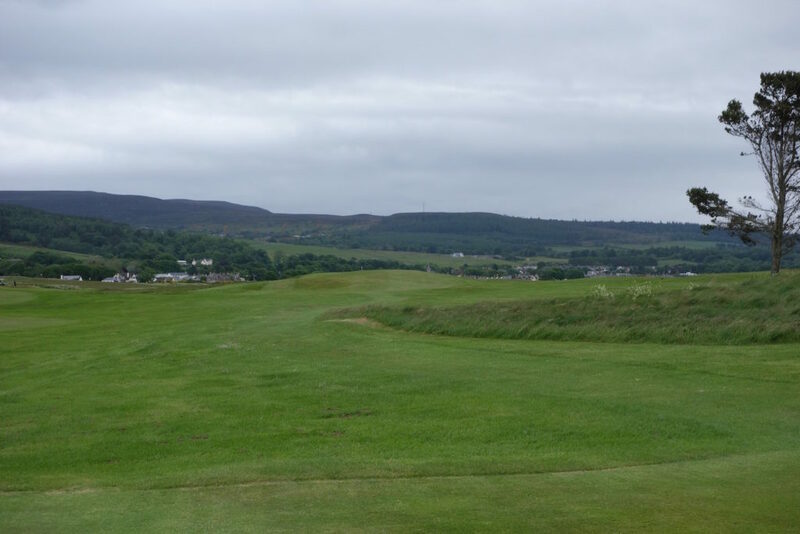 The course has a links section, a heathland section, and a parkland section and although the routing flows well, each section is recognizably different. Holes one through eight are links and run alongside the North Sea. Hole eight through eleven are heathland and could be mistaken for a course south of London. 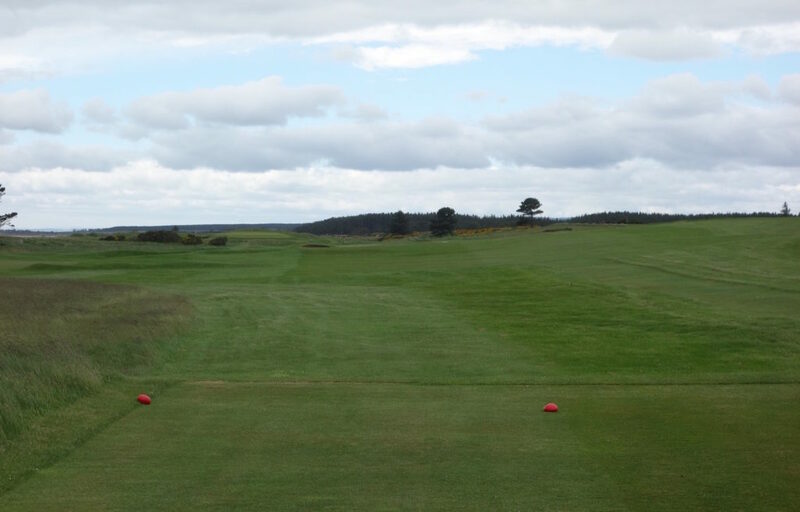 Twelve through eighteen are parkland with hints of links golf on the final three holes. My favorite hole on the course is the 17th, which fortunately has a bench behind the tee to sit and soak in the view. A final interesting note is the history of the Highlands, which is something you’re constantly reminded of throughout the round by the Sutherland monument. 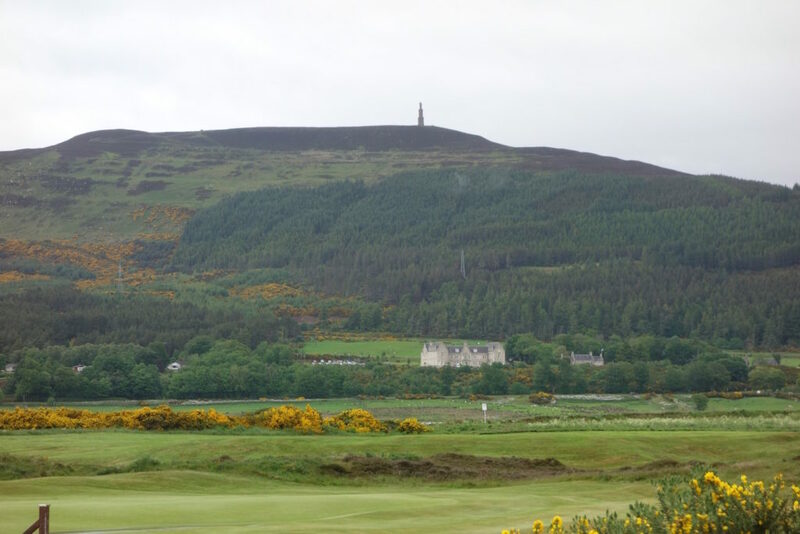 The monument is a 100-foot-tall statue of the Duke of Sutherland on top of a Ben Brahggie, a mountain overlooking the town and links of Golspie. The statue is constantly visible throughout the round is a reminder of the turbulent history of the Highlands and the Clearances. I strongly suggest reading up on the Clearances, which deserve much more than a few sentences here. The brief overview as it pertains to the area surrounding Golspie is that in the late 18th and early 19th centuries, the first Duke of Sutherland cleared all of the tenant farmers off of his land, resettling them in coastal villages to make way for sheep farming on the land. The farmers were forcibly removed from their homes and the period that followed was filled with death, famine, and the emigration of Scots to the Lowlands, America, and other parts of the world. These forcible and sometimes violent evictions happened all across the Highlands throughout the 18th and 19th centuries – not only around Golspie. It is a dark period of Scottish history, and once you’ve read about the Clearances, the huge statue watching throughout the round at Golspie feels dark and eerie. Hole #1 – 493 yards – “Backies” – The course opens with a dogleg left leading to a large raised green. Hole #2 – 166 yards – “Kirk” – The camera didn’t handle the dark rainy conditions well early in the round, but this second hole is a beautiful gem. During firm conditions, carrying those front bunkers while still holding the green is a tall task. 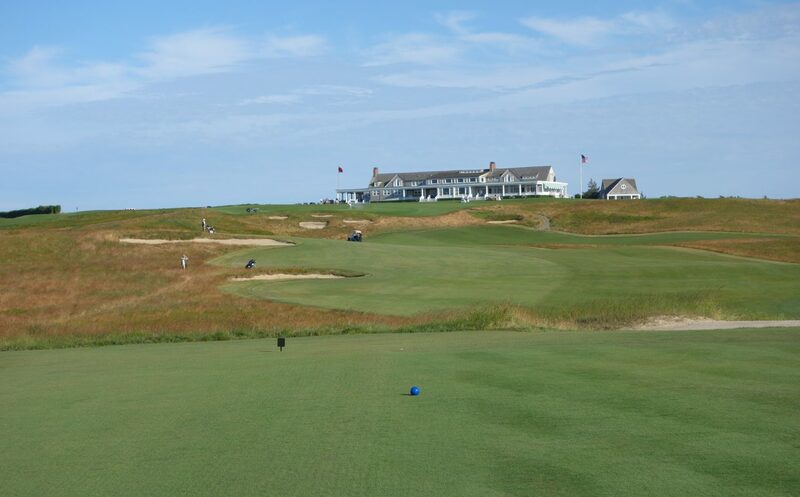 Hole #3 – 360 yards – “Shore” – The third is the start of three links holes right along the water. 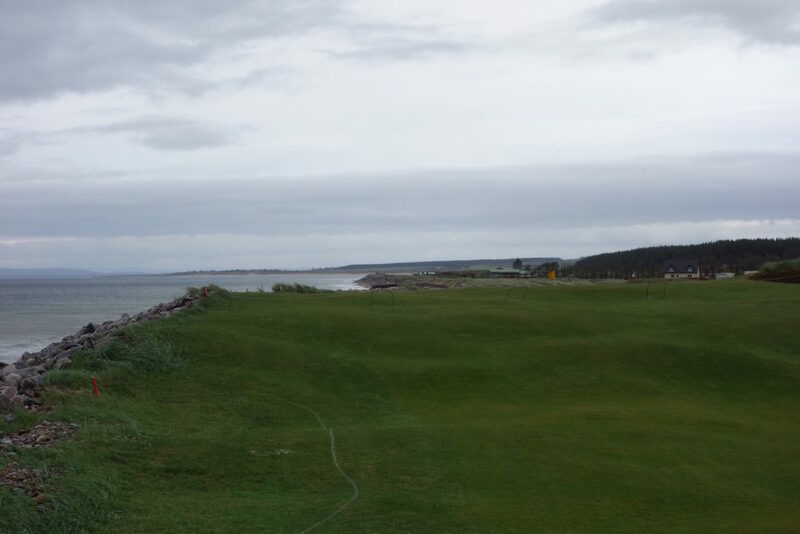 The club has fought erosion problems recently and you can see the rock pile “sea wall” in some of the photos below. Hole #4 – 522 yards – “Gully” – Very similar to the 3rd, but a par 5 running the same direction along the water. Hole #5 – 288 yards – “Sahara” – This drive-able par 5 is one of my favorite holes on the course. The stone sea wall borders one edge of the green, which is sunken 5-6 feet below the level of the fairway. 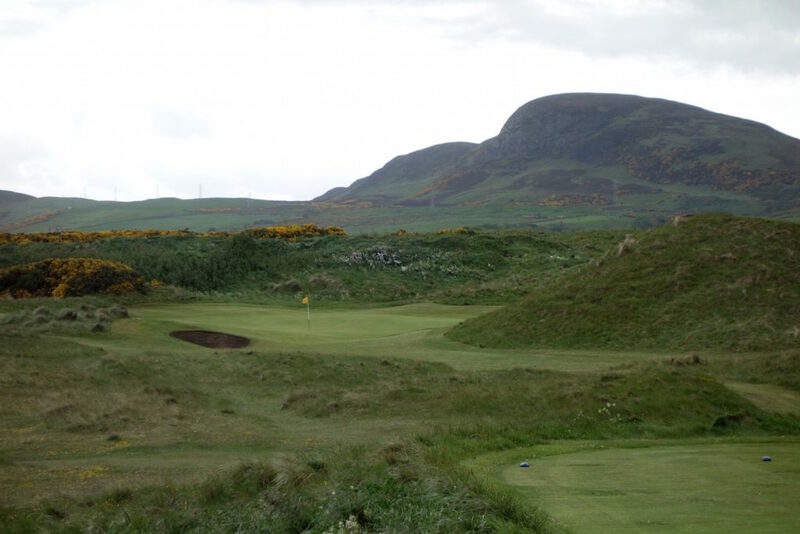 The green is reminiscent of the 14th at Cruden Bay and 13th at Dunbar in East Lothian. If you don’t drive this green, the short approach is very tough. Hole #6 – 151 yards – “Saucer” – This par 3 is one of the best holes on the course. 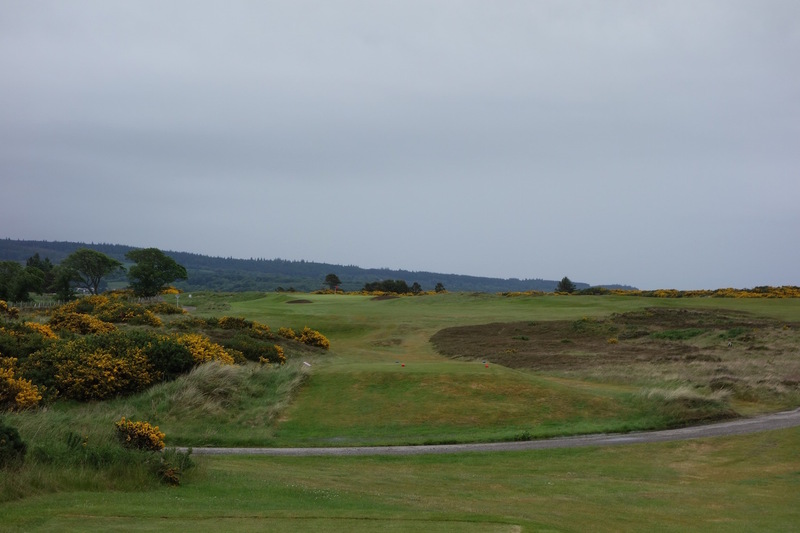 The green sits so naturally beneath surrounding dunes and gorse. The tee also backs up to the water, so you hear waves crashing as you hit the tee shot. 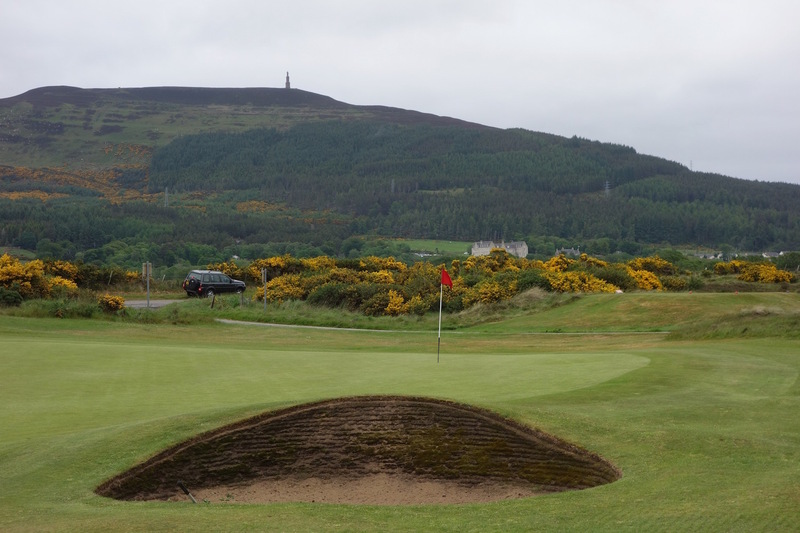 A group of small pot bunkers hide devilishly behind the dune on the right side of the green. Hole #7 – 285 yards – “Fleet” – Reminiscent of the blind holes at Prestwick, you aim at the marker post in the distance off this tee. The rippling land in front of the green can make for awkward lies and stances for the short pitch approach. Hole #9 – 420 yards – “Paradise” – The 8th is the first heathland hole on the course, but the 9th was my favorite of the stretch. You can also see how much rain the course got the night before my round. 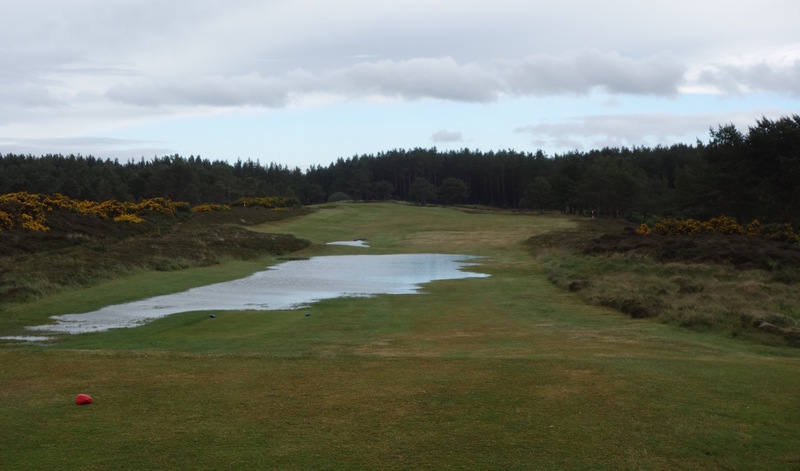 The links holes in the dunes were dry and firm while these heathland holes retained much of the rain. 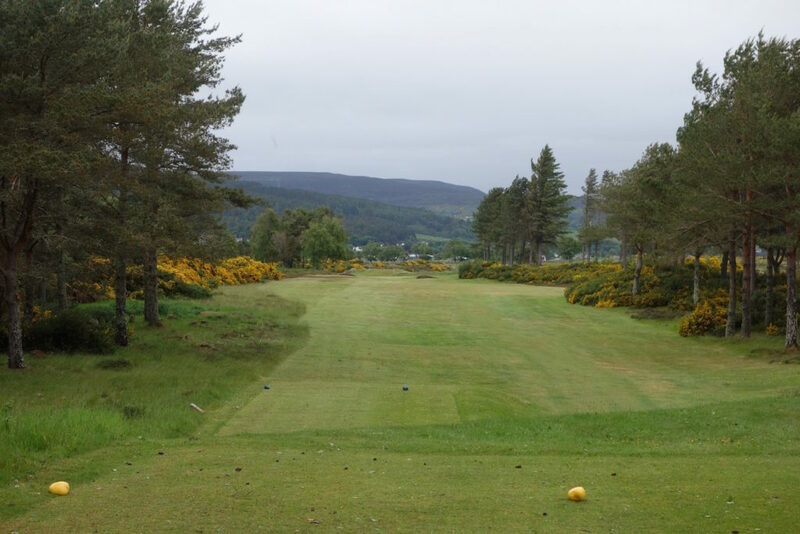 Hole #10 – 147 yards – “Lochy” – This par 3 is slightly awkward with the two trees that limit shot shapes and player’s vision of the hole. If the dark Highlands hill wasn’t behind the green, you’d think this hole was at one of the southern England heathland classics. Hole #11 – 347 yards – “Tinker’s Camp” – The course leaves heathland now and makes its way toward parkland. 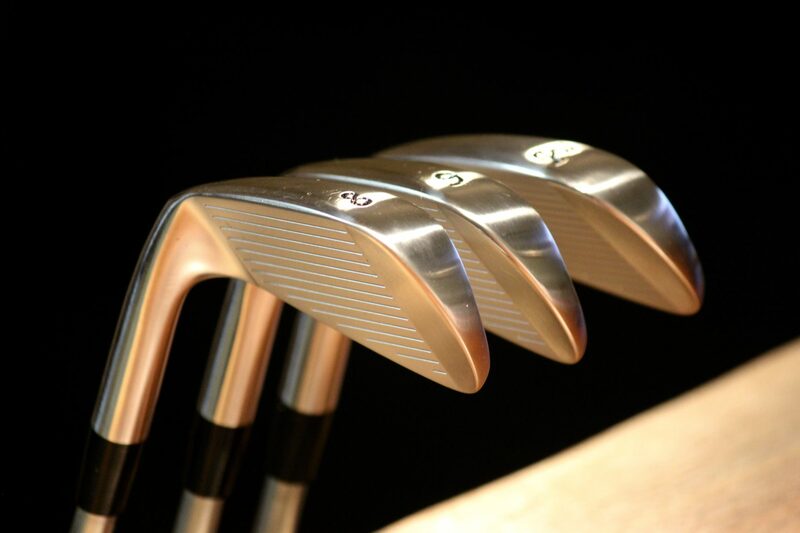 No need for driver on this narrow hole where the correct angle – left side of the fairway – is key for scoring. 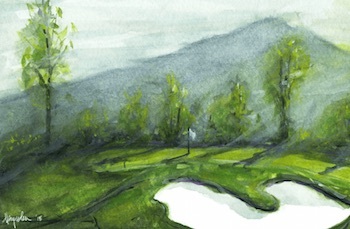 Hole #12 – 341 yards – “Table” – Play into the right side of the fairway on this short par 4. The green is long, narrow, and works away from the tee. 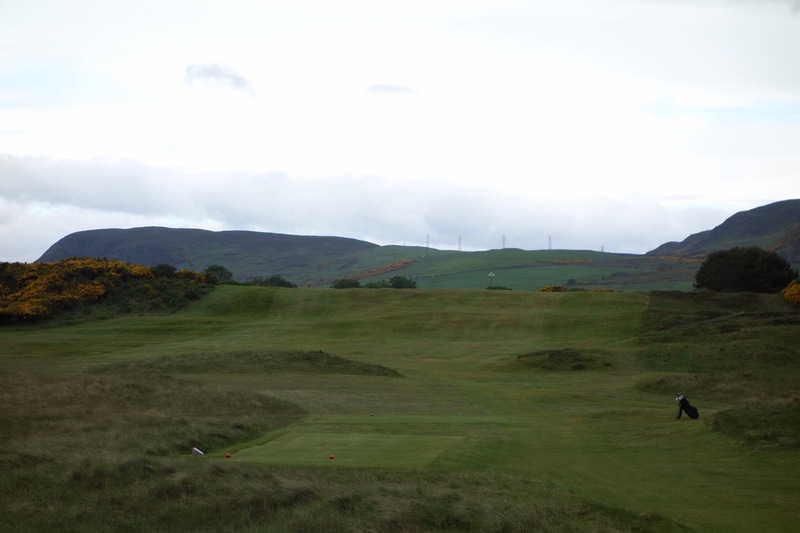 Hole #15 – 457 yards – “Tattie Pits” – Is there a better hole name out there? I think not. This is still the parkland section of the course, but there are hints of links on these last four. Hole #16 – 175 yards – “Cairngorms” – This is tied with the 6th as my favorite hole at Golspie. 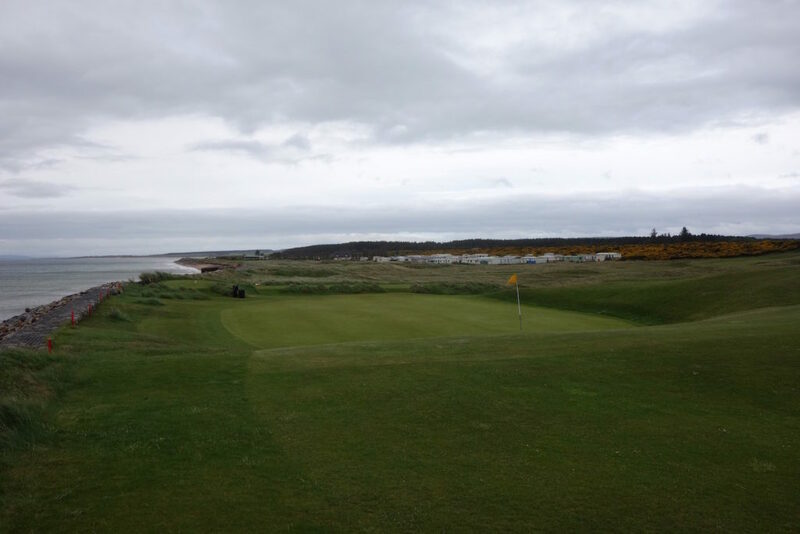 The green is perfectly framed by the North Sea and the rolling green could offer up some really tricky pin positions. The green is the highest point on the property, making it one of the most beautiful – and exposed – points on the course. Hole #17 – 211 yards – “Sahara Back” – After the beauty and drama of the 16th, this par 3 admittedly feels lackluster. It’s also tough having never seen the green before, which is blind from the tee due to a raised front edge. The photo below is taken from right of the green. 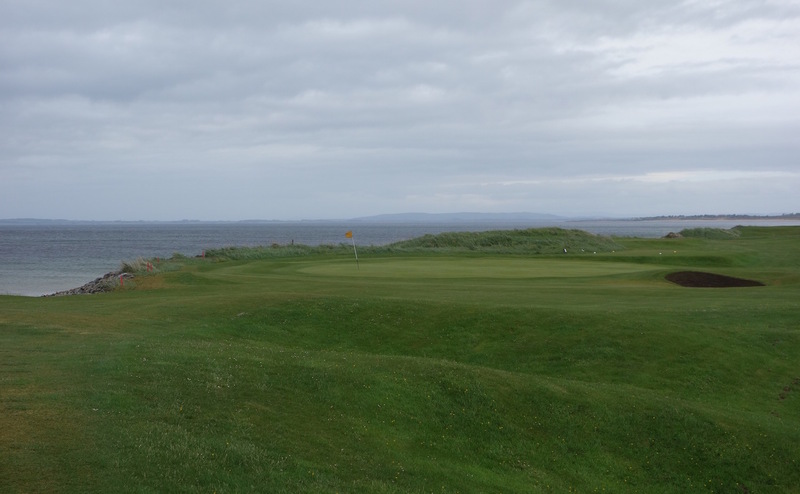 Hole #18 – 443 yards – “Drumbrae” – The final hole is one last taste of links golf quirkiness. The large mound in the fairway creates a blind approach to this green. The hole is long enough that drives land short of the mound and golfers have to hit their approach shots over the marker post on top (as seen in the second photo below). 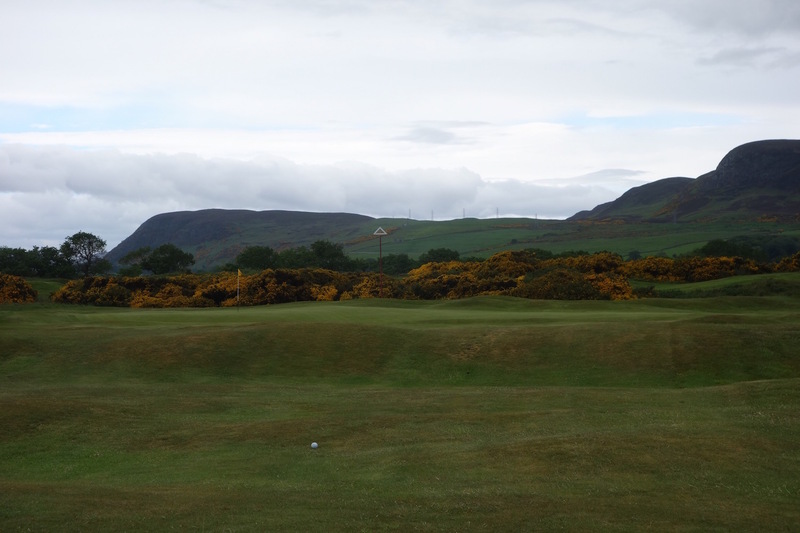 There are many holes at Golspie that I wish I could play over and over again… I’ll be back! 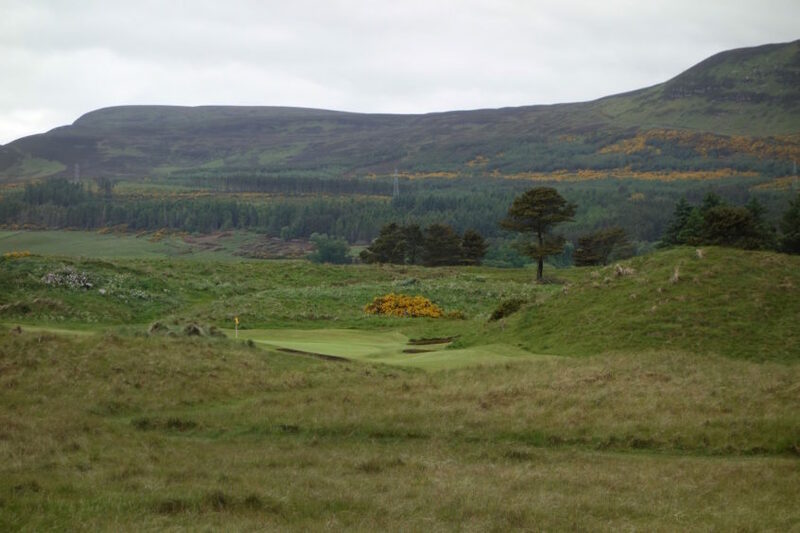 It would be a shame to visit the Highlands and only visit Royal Dornoch. Once you’ve journeyed that far north, take the time to visit Golspie. 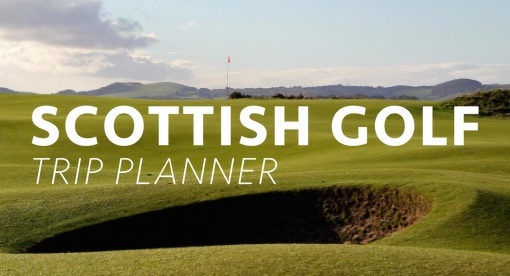 It’s a true local gem that embodies the best wholesome roots of Scottish golf. Hey graylyn, really enjoyed the review and nice to see plenty of photos . Golspie has always been on my radar for whenever I manage a second trip to dornoch at some point In the future . Will definitely check it out now . One question, what was the overall condition like ? The greens in the your photos look pretty good. 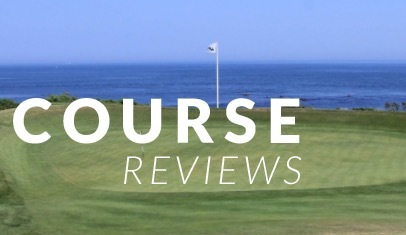 How does it compare to other courses I’ve played? The Eden for example? 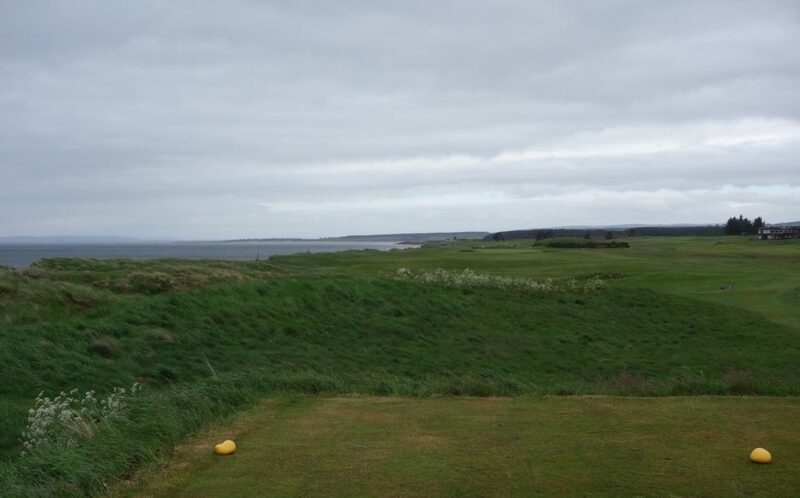 Or brora , or somewhere like cruden bay ? Hi Ben, It’s definitely worth the stop on your next trip to the Highlands. 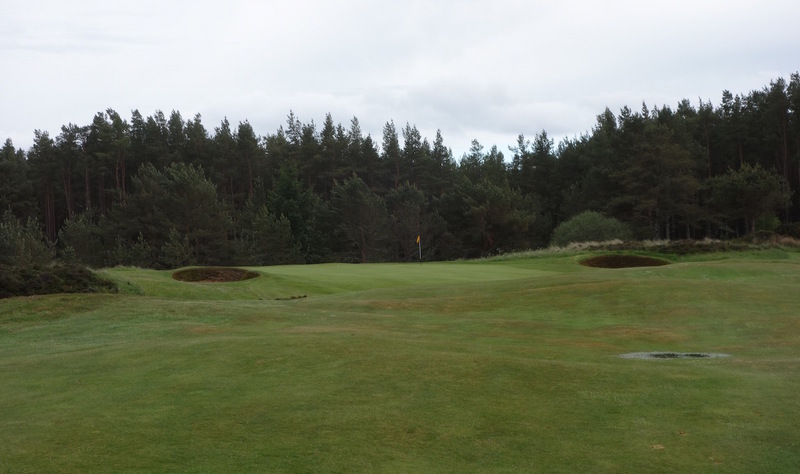 The conditions at Golspie were excellent during my visit. 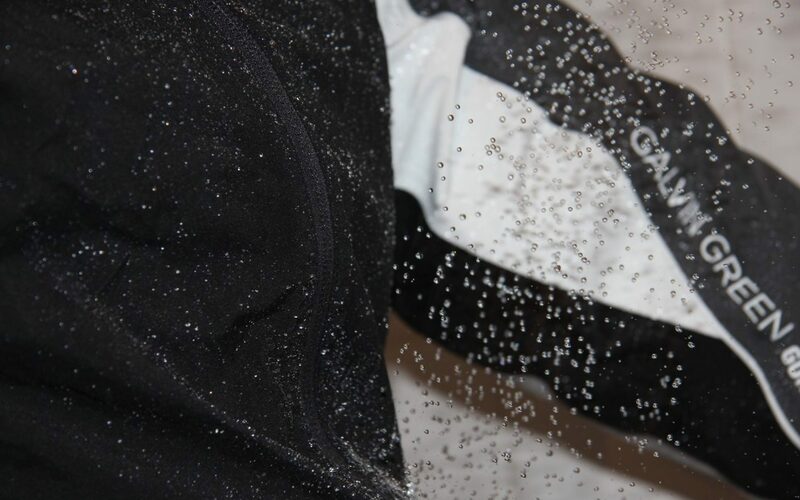 As you can see in the photos, the course had received multiple inches of rain the previous two days, but it handled the water well almost everywhere. 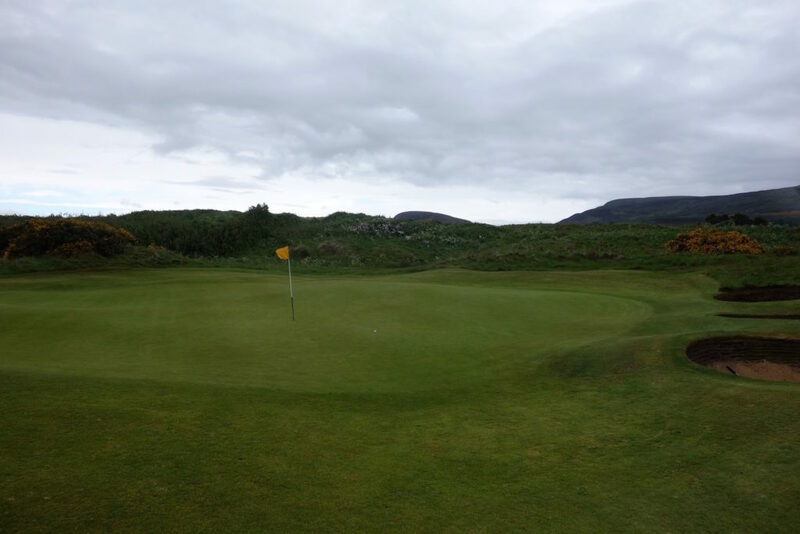 The greens were quick and on par with a Cruden Bay, Gullane, or Prestwick. 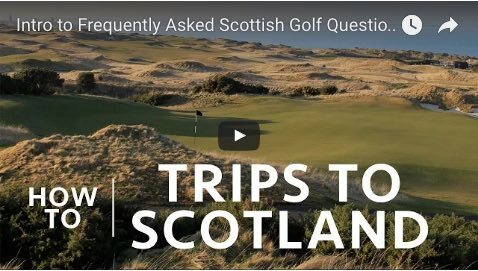 I played the course three days after a Scottish amateur event, so that may explain why it looked so good, but I did speak with the superintendent who said the conditions were typical of a high-season day. Thanks Graylyn, been up that way twice now and can’t get enough of it. 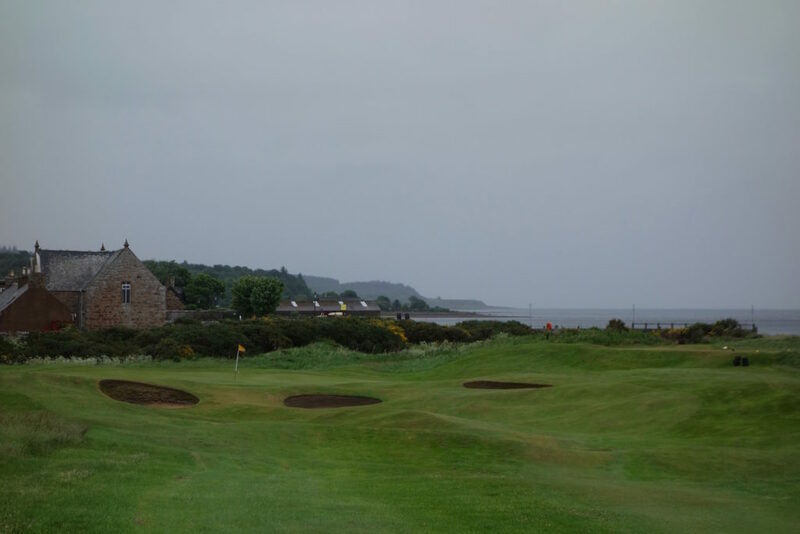 Great review of Golspie and as you well know both Brora and Tain are wonderful as well. 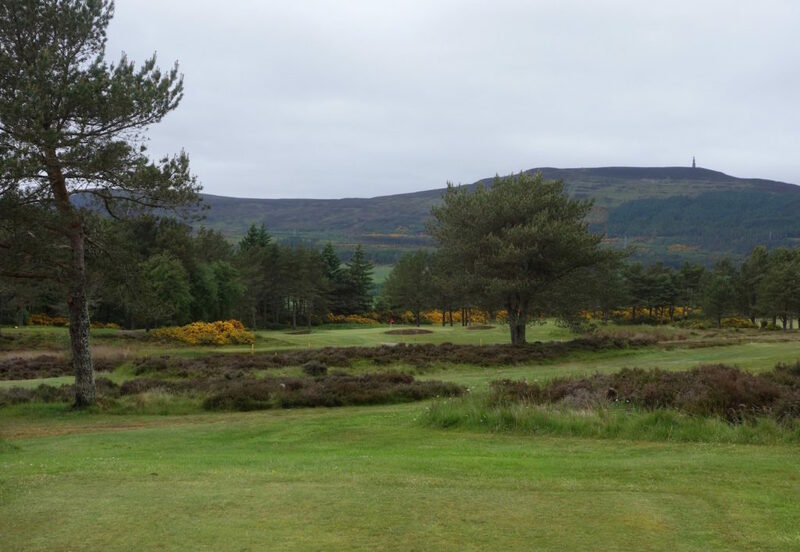 Royal Dornoch is simply the best, and the Struie is a bit of welcome relief after being beaten up day after day! Not to mention the local hospitality is very special. Hi Dan, thank you for the comment! I was able to play Brora, but didn’t get to Tain or the Struie (although I walked the latter). I can’t wait to get back up there to see both of those, plus others still on my list! 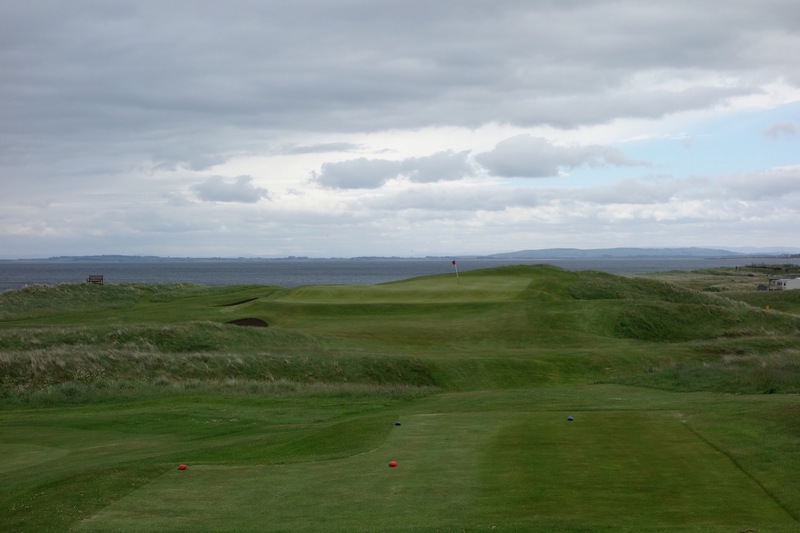 I haven’t play Nairn, nor Wick and a handful more on my bucket list… one day!